Works on paper is a selection of drawings, sketchbook pages and exploratory work for specific projects and exhibitions. Sketchbooks have always been integral to my thinking. Whether working through ideas or using them as a place to revisit ideas. Thoughts can be fleeting and there's a pivotal moment an idea expands from. It can be as subtle as a particular sound, scent, image or an environment. These are the moments a sketchbook/notebook becomes invaluable to capture these thoughts before they are lost. 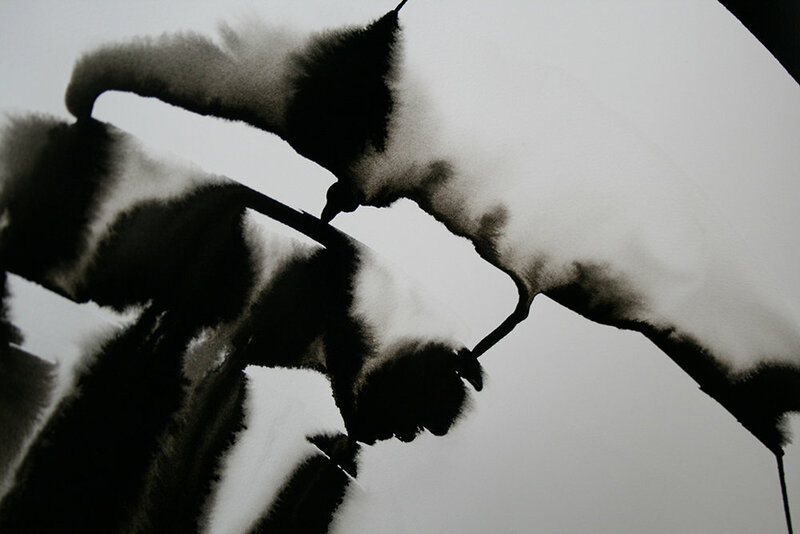 The large ink and water on paper were drawings made for Experiential Spaces: Pause in 2009 - 2011 by working on larger paper enabled me to begin to understand how my body was moving during the process of mark making. This later became a key element during the making process when carving clay on a human scale the very nature of making becomes so tied in with the physical. The movement within my upper body and arms along with particular tools came about from this early exploration and experimentation through these large ink drawings. The ink drawings filtered through a series of different sized funnels was developed for Repetition over time shown at the British Ceramics Biennial in Spode 2013. I began using ink as a process to see and document how liquid was falling on to a surface from varying distances. By changing the heights and size of the funnels not only was I creating a change in the marks that were being left but also the sound was something that I became aware of. These works on paper gave me a greater understanding about how this could then transfer to water falling onto 2 tones of puddle clay over a period of 6 weeks. It's a collection of objects that have been developed through the use and understanding of language and instruction.